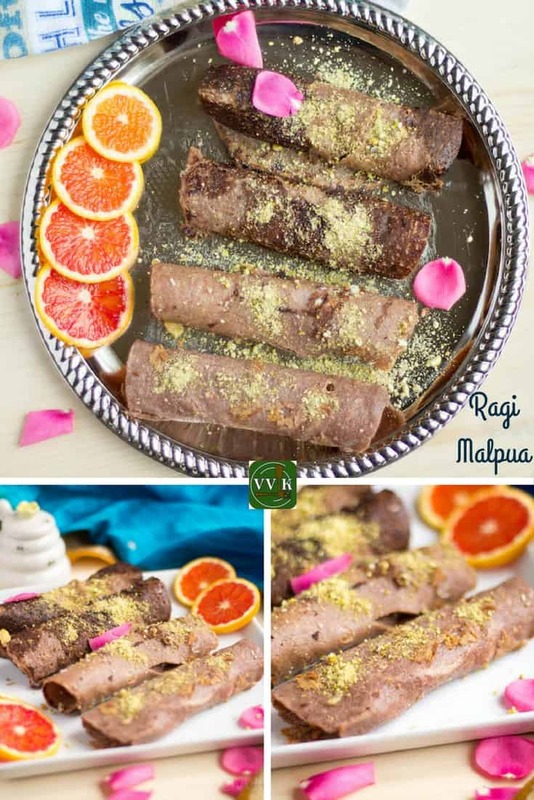 The second recipe that I am going to post under the “Holi Recipe” theme is the Ragi Malpua. 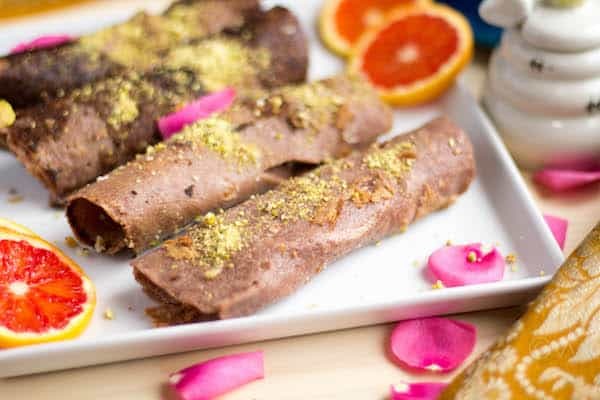 Malpua is a sweet pancake which is quite famous in Orissa, but it found its way to the other states and now it has become a popular dessert throughout India. Instead of frying the malpua, I prepared them like regular dosa and stuffed it with grated coconut – nut filling. Also, I made it with Ragi flour, Wheat flour, and Oats flour thus making diabetic friendly. The recipe is so simple. We need to mix all the flour along with sugar and milk to prepare the batter. Make pancakes/dosa with the batter and top it up with coconut-pistachio filling and roll it up. Errr you might as well call this as stuffed sweet dosa or stuffed pancakes. ;-) As you can you see from the pictures, two malpuas are brown whereas the other two or not. 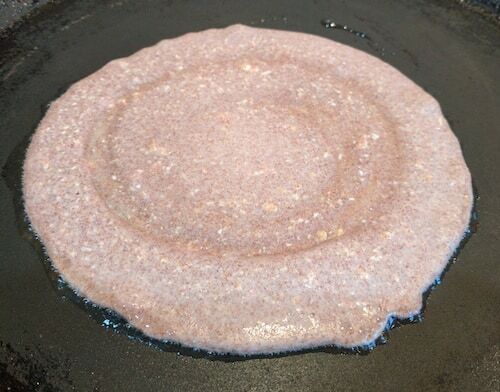 Because of the sugar addition and ragi flour, they malpuas tend to turn brown. In fact, in the original recipe, they asked to cook until they are brown. But the brown layer quickly comes off like in ragi dosa. So for two malpuas before filling, I tried to remove the brown coat, and for other two I let it stay. Without any further ado, here is the Ragi Malpua recipe. 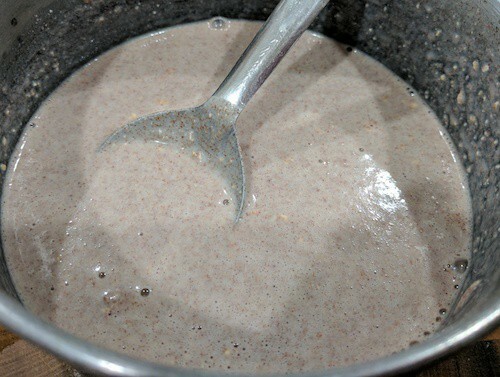 Grind about 1/4 cup of old fashioned oats coarsely and take about 1 tbsp. I did not dry roast the oats, but you can dry roast them and grind the oats. Remove the pistachios from the shell and dry roast them for a couple of minutes. Grind it coarsely and set aside. Grate about 2 tbsp of coconut and set aside. If using frozen, thaw it to room temperature. 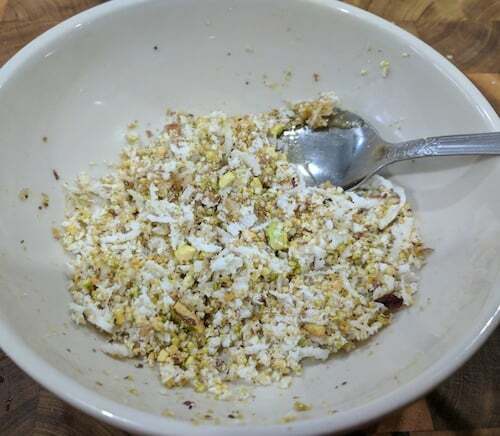 Mix the grated coconut, ground pistachios, green cardamom powder and honey/nectar together. Make sure the ingredients are well incorporated. In a mixing bowl, add the ragi flour, wheat flour, and oats flour along with a pinch of salt and powdered sugar. Mix them well and slowly add the milk and form the batter. The batter consistency should be pretty much like dosa batter consistency. Heat the tawa or griddle and pour about one ladleful of batter and spread the malpua slightly. Drizzle some oil around the edges and let it cook for about 50 seconds to 1 minutes. Now slowly flip and let the other side cook for about 45 seconds. Malpuas should not be crisp so do not let it overcook. If its crisp, rolling might become hard. After 45 seconds remove it from the griddle and prepare the remaining malpuas in a similar way. 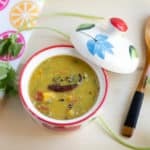 Add about 1 tbsp of coconut pistachio filling and place it in one corner of the cooked malpua. Similarly, roll the other malpuas with the filling. Drizzle the remaining filling on top and serve with your favorite fruit or additional honey drizzled. Adjust the flour measurements as per your preference. Instead of powdered sugar, cane sugar or jaggery can be added, but the malpuas might turn brown. Do not let the malpua to become crisp and then rolling might difficult. Brown edges and back side are completely ok. As I mentioned above, I removed the brown layer in two of my malpuas. You can get creative and vary the inside filling. 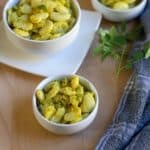 You can replace pistachios with your favorite nuts, ignore coconut and prepare a filling with only nuts. The sky is the limit here. Submitting this post for the BM# 73. Check out the other participant details here. 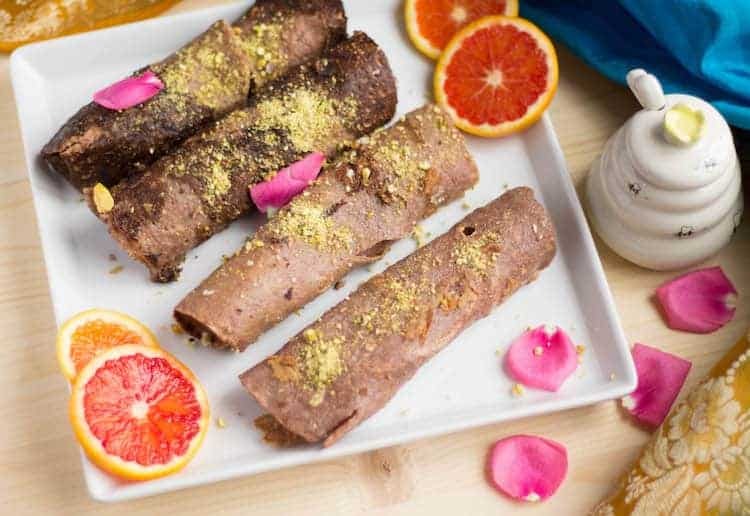 Holi special diabetic friendly malpua, prepared with ragi flour, wheat flour, oats flour with coconut-honey-pistachio filling. Adjust the flour measurements as per your preference. Instead of powdered sugar, cane sugar or jaggery can be added, but the malpuas might turn brown. Do not let the malpua to become crisp and then rolling might difficult. Brown edges and back side are completely ok. As I mentioned above, I removed the brown layer in two of my malpuas. 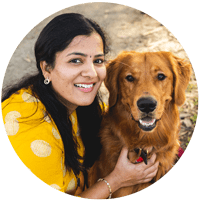 Lovely twist to the traditional malpua! Healthy and yum. …. love the presentation !!! 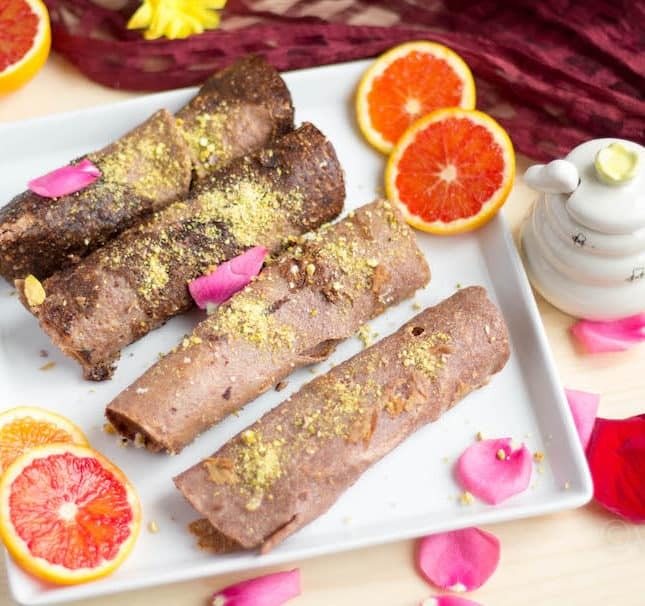 Love the idea of using ragi and oats together to make this yummy dessert. 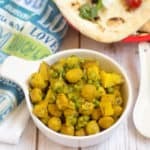 Love the healthier version of malpua. Wow.. Malpua with Ragi.. A great share totally.. Would love to try it sometime!! Thanks Sharmila. Please do try it out. 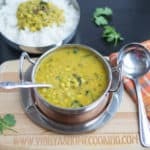 It’s quite a different take on traditional malpua recipe. But i like the idea of using ragi and oats.Looks delicious and inviting. 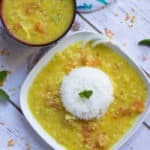 Healthy and delicious treat Vidhya. Malpuas with whole grains sounds delicious. Seriously wat a wonderful way to sneak ragi, this ragi malpua rocks. Traditional or not, these healthy malpuas look so nice. 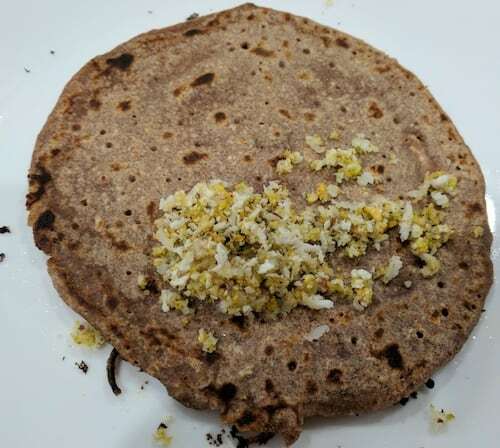 The filling sounds so yum..
Great thought of making malpua using ragi, oats flour. Looks great ?